The following horses are available for sale at K BAR R Ranch. By WI state law (WI Dept. of Revenue) all sales must include 5.5% sales tax on the purchase price unless an exemption applies. Full sister to 4 time ARHA World Champion stallion, “GIMME MY MISSION”. 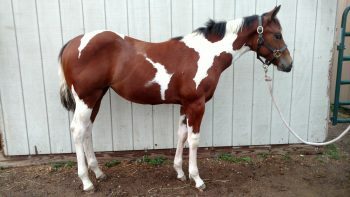 Superb mind, looks and conformation, this filly will win in both ARHA and APHA show competition. Absolutely the sweetest horse you will ever meet. Markings will have her at the top of the color classes as well. Must go to a show home only. APHA, ARHA Show Gelding. Born 3/21/17 by LOPIN IMPULSE, our World Champion producing stallion, and out of a ZIPPO PINE BAR mare. Solid paint bred APHA registered and ARHA registered. Was shown in ARHA/WRHA in 2017 as a weanling – finished the 2017 season for ARHA at #2 in the Nation in Amateur 2 & Under Stallions. 22 total ARHA points in 2017 as a weanling! 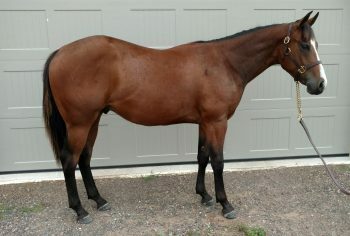 This beautiful bay gelding is the quietest, friendliest colt you could ask for. Clips, bathes, great for farrier and shots, loads, hauls and stalls terrific. Has been long hauled 12 hours to the Midwest Classic in IN – did great! Had an awesome mentality at all the shows and he was just a baby! UTD on trimming, vaccines and deworming. Incredible pedigree, beautiful looks, terrific mind and winning show experience makes this the total package for your next show horse.